When I was a student at Fresno State in the mid-1990’s, it was very clear what the town’s identity was – Fresno State football. A reputation for success was paramount every fall, a rite of passage for the Valley faithful. But in 1995, there was a new sheriff in town, a prodigal son who returned to his alma mater to resurrect the dormant hoops program. There was no hotter ticket than to see Jerry Tarkanian’s Bulldog basketball teams wreak havoc on everything – the opponent, themselves, the town. It was an outlaw band of misfits that played hard and partied harder. And no one on the team was more intriguing than a tough guard from Fall River, MA named Chris Herren. To make a long story short, Herren was a basketball prodigy who grew up in the spotlight. He enrolled at Boston College out of high school, was kicked out for drug use, and came to Central California for a second, and probably final chance at the dawning of the Tarkanian era. And for all his talent and potential, drugs wrecked his career after college, his life, his family and almost his marriage. A disease. Something that cannot be controlled. Something that takes root inside of a body and doesn’t always let go. The lucky ones survive a disease. And now, Herren is a motivational speaker, the subject of the ESPN documentary “Unguarded,” and now celebrating year four of sobriety. Alcoholics weren’t considered sick in 1935 when a raging alcoholic named Bill Wilson, also known as Bill W., was looking for a fellow drunk to talk to in order to keep up his five months of sobriety. There was not an Alcoholics Anonymous just yet, just the thought that praying away the inner-demons would be sufficient. The West Coast premiere of “Bill W. and Dr. Bob,” performing through July 15th at San Jose Repertory Theatre, is the story of two alcoholics and their fledgling group called Alcoholics Anonymous, an organization that has helped millions worldwide with the disease. The play is a magnificently staged piece, smoothly directed by Richard Seer, with numerous deft and poignant touches for the audience to grasp. Written by physician Stephen Bergman, who is billed by his pen name of Samuel Shem and his wife Janet Surrey, a clinical psychologist, the play is laced with gentle and memorable touches that work marvelously showing the journey of these two men who need each other. However, where the play can continue to sharpen is in its understanding of intentions. Not all motivations are completely clear, and a few of the initial meetings between the duo and their potential clients felt a bit forced. It wasn’t always clear as to why their wives remained by their sides, a critical piece of a story such as this one. But where the play is remarkable is how the principals understand their own process. Bill W. ( A sharp, emotionally demanding turn by Ray Chambers), has hit the bottom, getting into a fight in a bar. He says no to a drink, but one in his face is too much to overcome. While he lay in a hospital bed, he feels a force take him over, and he begins a path to recovery. But in order to fend off the ability to stay away from a drink, a feeling he describes as “every cell in your body is as dry as sand,” he looks for someone to talk to. And he finds a surgeon so possessed with alcohol that he performs surgeries while either drunk or hung over. Dr. Bob (a pathos-filled turn by Robert Sicular) is on the brink of losing everything, but feels he can do nothing to stop himself. He is a monster without alcohol, but Bill points out that he is a monster nonetheless. And when Bill approaches Dr. Bob’s ultra-Christian and desperate wife Anne (a demanding Kandis Chappell) to request a meeting with the doctor, she gives him 15 minutes, which easily turns into six hours. While praying is a noble venue to curing alcoholism, it isn’t terribly pragmatic or effective. And while Dr. Bob has a lot to lose if he doesn’t get help, Bill might lose the love of his life Lois (a dazzling Carrie Paff, who dazzled in the Rep’s production of “Double Indemnity). The play was filled with many wonderful moments and performances. Both Cindy Goldfield and Mike Ryan definitely did plenty of work playing multiple characters. Add a wonderful skene for a set designed by Robin Sanford Roberts, which by my own way of calculating, probably had about 600 empty bottles that hovered over the action. It was a powerful metaphor, a reminder that even though a drink is not in the hand of one in recovery, it’s always present. And a critical piece of AA, which is Al-Anon, the support group for the wives and families is subtly shown. What worked so well was the plays ability to sneak the meeting on the audience. Three women in the same place sitting and facing each other awkwardly was a powerful tableau. But my favorite moment was also one of the funniest. While Dr. Bob fights off the demons of detox, Bill tries to feed him a tomato, much to the chagrin of the doc. And what followed was an absolutely heartbreaking moment. Yet, it was at the heart of the bond of friendship. I was reminded of the beautiful scene from the film “Pleasantville,” when Tobey Maguire’s character David gently puts makeup on the face of his mother Betty (Joan Allen). “Bill W. and Dr. Bob” is a story of friendship, vision and heroes. And with just a bit more attention to women like Lois and Anne, we will never forget about women like Heather. 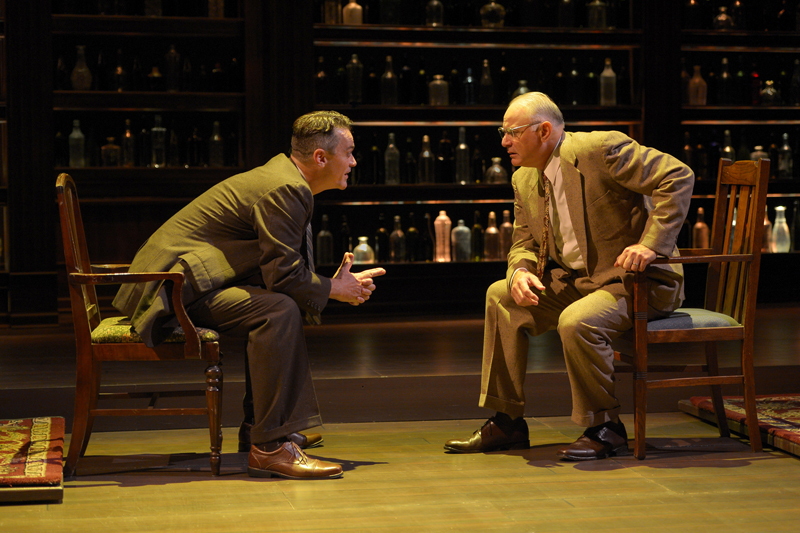 The Word: An interesting and entertaining play about two American pioneers who changed the way alcoholism is viewed. Tickets range from $10 – $79. For tickets and more information, call (408) 367-7255 or visit www.sjrep.com.